If You Don’t Pass Your Checkride After Completing My Course… I’ll Pay For Your Checkride! The Absolute BEST GUARANTEE In The Industry. As a Bonus To The Over 400 Videos You Can Participate In Our LIVE Weekly Webinars and Mock Checkrides! Interact With Us LIVE Each Week. Truly Flight Training On The Go. Use Our Mobile Friendly Online Ground School To Fit Into Your Busy Schedule Even On The Go From Any Mobile Device. Our Course Is Never Out of Date. As The FAA Makes Changes We Make Adjustments. You Can Rest Assured Knowing Our Course is ALWAYS Up To Date. Flight Training As Mobile As Your Are. Take Our Over 400 Videos, Audios, Quizzes, and Webinars With You. At Work, On a Walk, and During Your Commute. Finally Flight Training That Fits Into Your Busy Schedule. Works Across All Mobile Devices! It’s Flight Training and Ground School On Your Time. Becoming a pilot was a dream of mine for many years. But career & life got in the way many times. 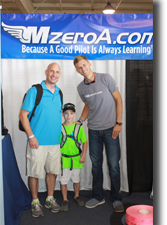 Then in 2013 I discovered the MzeroA.com Online Ground School & my dream was a reality. I finally had a way to learn in a system that was compatible with my career because your materials are set forth in modules that allowed me to attend the ground school when my schedule permitted. The Online Ground School is delivered with personality, fun, and passion, which is consistent with your feelings and devotion in aviation. Thank You! – Mark Tilkens Private Pilot and Now Aircraft Owner. Pass Your Checkride or I’ll Pay For It! Join today and get access to the #1 Online Ground School.